Located in the southern area of Alpes de Haute Provence, Pra-Loup is made up of two satellites, 1500 and 1600. 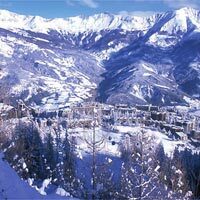 It shares its ski area with Foux d'Allos and they offer a combined total of 160km of marked pistes. In addition, there is great off-piste for the advanced skier who may find the selection of black runs a little samey after a couple of days. Most of the skiing is ideal for beginners and intermediates, who will enjoy great scenery and tree-lined pistes down to the resort. One of Pra-Loup's biggest attractions is its good value, particularly when compared to more famous resorts further north and east. The lift service is very efficient, but queues can occur at weekends as people head in from southeast France. Pra-Loup does have a southerly location and sits at a fairly low altitude. Hotels and apartments provide the majority of accommodation. Pra-Loup tends to attract a French and Dutch clientele and isn't featured in most of the big tour brochures. Overall, Pra-Loup is basically a French family resort with good skiing, a moderate nightlife and reasonable prices. For people flying in, the nearest airport is Marseilles (250km away), so transfer times can be lengthy.